So we finally have gotten around to working a bit in our backyard to make it a more fun, more accessible place for Rojo. 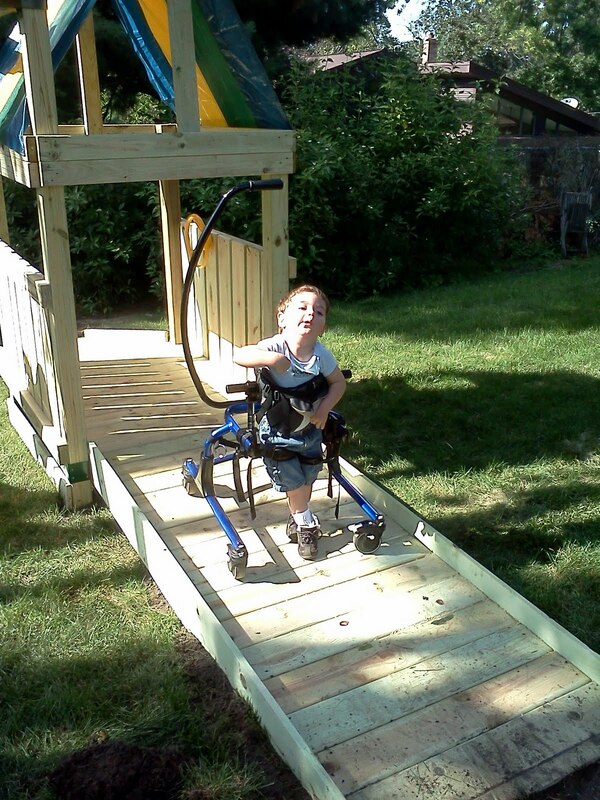 We took out our old rusty swingset and had a cedar set custom built with a playhouse ramp so Roa can enter and exit. HE LOVES IT! Auntie Ellen and Uncle Bill got Roa an adaptive swing last year for his birthday, so the new playset is perfect for him and Gunnar. Along with the set, we had a 16x16 sandbox with an entry point for the gait trainer. A TON of sand was added this weekend thanks to our neighbors Russ and Kelly, and we are in business! Unfortunately, by 8:00... both boys were exhausted and ready for the house and bed! No sleep out this time... maybe next time we will brave the tent and sleeping bag extravaganza! Roa got his new Imp trike! It is pretty cool and he liked showing it to all his fans in our neighborhood. It needs a new handlebar that fits Rojo a bit better, but otherwise it is a wonderful new mode of mobility and play. We had the Conductive Education Fundraising Walk and Family Picnic. Small turn out for Team Roa, but we haven't learned of the donations towards his therapy yet. If you donated, we thank you and appreciate the support. Last week we had a carpenter build a swing set/playhouse with a ramp for our backyard. Roa and Gunnar love it! The ramp is a hit as Roa walks up in his gait trainer on one side and zooms down fast on the other! 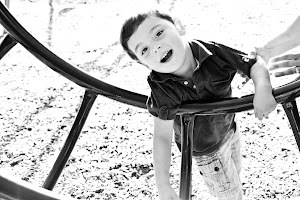 This week, Jeremy the carpenter, will be back to build a sandbox- 16x16 with a sensory table, mud pie kitchen, and gait trainer entry ramp- is in the plans. Today, Roa has speech and OT. A representative from the Dynavox company will be at the session to try out a few assistive tech. devices with Roa. We have upcoming appointments at Gillette to review Roa's Botox effects and also a consultation to find a seating system that best fits his needs. Andrea, PT from Courage, would like us to opt for a manual wheelchair so that Roa can learn to propel himself around a room. We will give it a shot. Roa has been gaining strength all summer and is attempting to maneuver a supported crawl! Very promising. He also has mastered saying Hi and his name. When that sweet little voice says, "Roa", I simply melt! More later gotta run. Today is a busy one! Roa is at Conductive Ed this morning and when he gets home, we are off to Courage Center to visit Andrea, PT. It has been a few months since Andrea has seen Roa, so it will be great to get her input on exercises and ideas to work on continued progress with mobility for Rojo. Andrea also will be helping us pick a push chair/stroller for Roa to use for school. It is hard to believe, but in one month, Roa will be heading to Early Childhood three days a week! We are no where near where we wanted to be in movement, self feeding, and potty training,but....this is a marathon not a sprint....as Bryan always says. We are excited for this weekend as we will be participating in the Plus Center's Walk for Conductive Education and Family picnic. This is a great time for friends and family to support Roa and other kids with cerebral palsy, learn about the program, meet others, and hang out. Unfortunately, i think Roa's group of supporters will be a small one as the majority of our family and friends have other weekend plans, but we will be an excited small group! If you would like to make a donation to support Roa's continued program, please contact me for info. We pay for Roa's conductive education and transportation out of pocket as our insurance does not cover this form of therapy. Well the swallow study went off without a hitch. Gunnar stayed home with Brittany so mom and dad could focus simply on Roa. It was a quick wait in the waiting room...long enough for Ro to hang out in his GT in front of the bubbly fish tank. We entered the X-ray room and talked to the therapist about our concerns and questions. Roa was placed in a feeder seat by the X-ray machine and was mesmerized by the enormous tv screen showing sea creatures! Perfect! He then was fed a variety of textures and food/ drink consistencies and took it all like a champ. However, it would have been beneficial for him to do some of his gagging gigs and turning to the right to show one of our concerns, but as life goes...no gagging. As Roa ate, the doctor and therapist watched him on the X-ray machine. Roa does have some pooling of food residuals in the back of his throat on occasion. However he was able to clear it with head posturing, a throat clearing, or drink. Next we did the barium swallow X-ray check for reflux. Roa drank the chocolate laced barium like a milk shake! He cried when it was necessary for him to lie back on the table under the machine for the doctor to watch for reflux, but was easily distracted by sea turtles and more milk shake! Reflux was observed, but the doctor said it wasn't terrible and he seems to be maturing through it. Basically, the study showed that: yes, Roa does have reflux issues that may be eased with the prevacid and positioning after meals and at bedtime. And, he does have some food residuals that collect in his throat, but if we continue to allow him to posture as he sees fit for swallowing, it should not be a problem and should ease congestion. For therapy, we should focus on proper rotary chewing so that Roa learns to break foods down before swallowing. We should stay away from beef or tougher meats that are hard to break down. We should also offer frequent drinks to clear foods. The toughest part will be allowing Roa to position his head back for swallowing as it goes against what therapists want and what is typical. But as we work to strengthen his trunk and neck, typical alignment should be closer the norm. So, eat away little man! We will let you figure it out in your smart little brain on your own timeline! Tomorrow Rojo has another swallow study appointment at Gillette. The therapists at Functional Kids are questioning his conjestion after meals and his need to turn to the right with swallowing. It has been a concern for some time and a big piece of the independence puzzle. We are anxious to find out if perhaps Roa is still having issues with reflux that prohibit him from maintaining correct posture while seated. We are back on Prevacid for nights but haven't noticed a huge difference in sleep patterns, he still is up 1-2 time per night. Hopefully the swallow study will give us some answers. On a positive, Roa has been a CHAMP at attempting to self feed and drink! He is working hard to get the food, utensil, or cup to his mouth and often succeeds with help getting it positioned in his hand. This step is a huge one towards self care and will help him so much when he starts school this fall. As for school starting soon, ughh! Scary! 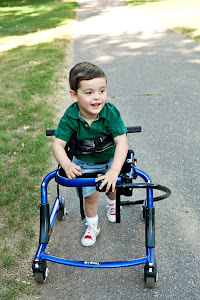 We are currently looking at purchasing a stroller/push chair/high low base for school and bus transport. We are also looking to balance his therapy schedule and still give the poor guy Mommy time and a nap! It will all come together, I know. But right now, it is overwhelming. FYI, our top push chair pick is the Snug Seat Stingray. Pretty sweet ride for the King!